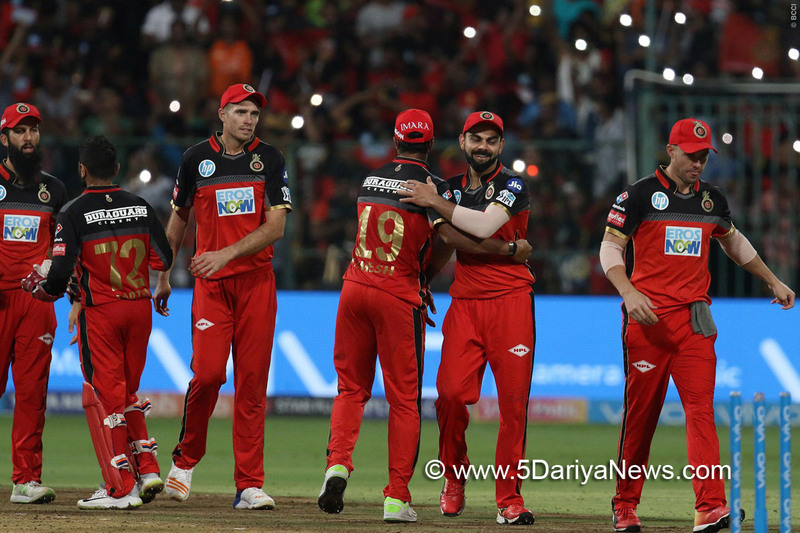 Royal Challengers Bangalore kept their playoff hopes alive as Sunrisers Hyderabad's skipper Kane Williamson (81 off 42) and Manish Pandey's (62 not-out off 38) blistering knock went in vain in a crucial Indian Premier League (IPL) clash at M. Chinnaswamy Stadium here on Thursday.It was once again Williamson, who along with Pandey forged a crucial partnership to take Hyderabad on the verge of another nail-biting win. However, it was the hosts who clinched the issue by 14 runs to keep their playoff dream alive.Chasing the massive 219-run target, Hyderabad openers Shikhar Dhawan (18) and Alex Hales (37) took their side to a quick start, accumulating 47 runs in the first five overs.However, the decent start was short-lived as Yuzvendra Chahal drew the first blood for the hosts in the sixth over when Dhawan came down the track but chipped back to the bowler.With addition of another 17 runs in Hyderabad's scorecard, AB de Villiers took a stunning catch at deep midwicket to pack back Hales off a Moeen Ali delivery.Skipper Williamson and Pandey then took the command, taking their side to touch the three-figure mark in 11.3 overs.Meanwhile, the Hyderabad captain slammed his half-century off 28 balls, helping his side inch closer to the target.The duo went on to forge a crucial 135-run partnership for the third wicket, lifting the visitors to 199 runs in 19.1 overs.With 19 needed off the final over, Mohammed Siraj jolted Hyderabad dismissing the visiting skipper to bring back Bangalore in the game.Williamson's knock was laced with seven fours and five sixes. Pandey and incoming batsman Deepak Hooda could only manage five runs off the final five deliveries as the hosts sealed the match by 14 runs to keep them afloat in the league.For Bangalore, Chahal, Siraj and Ali bagged one wicket each.Earlier, de Villiers and Moeen Ali smacked breezy half centuries to help Bangalore overcome a shaky start and post a mammoth 218/6 against Hyderabad in a must-win tie.De Villiers (69 from 39 balls; 4x12, 6x1) and Moeen (65 from 34; 4x2, 6x6) put on a 107-run third wicket stand to resurrect RCB's innings which fell apart after the early loss of the opening duo of Parthiv Patel (1) and skipper Virat Kohli (12).Put in to bat, Parthiv failed to take advantage of the dropped chance off the very first ball and departed off the final ball off Sandeep Sharma, caught by Siddharth Kaul at third man.Kohli followed his opening partner soon after adding 32 runs with de Villiers, as the India skipper's struggle with the spinners continued in this edition of the IPL. The right-hander attempted to slog Rashid Khan's fuller length delivery hoping for a googly only to find his stumps re-arranged.Struggling at 32/2, de Villiers and Moeen changed the complexion of the innings in no time, with both batsmen trying to outscore each other as it started raining boundaries at the Chinnaswamy Stadium.De Villiers started with two consecutive boundaries off Shakib Al Hasan before sending the other Hyderabad bowlers to the leather hunt, before Moeen joined the party by welcoming rookie pacer Basil Thampi with two consecutive sixes. In no time, the South African veteran brought up his half century in mere 32 balls, when he pulled medium pacer Kaul for a boundary before Moeen, who was dropped on 23 by Dhawan off Sandeep, turned on the heat by meting out some special treatment to Thampi.The English southpaw mercilessly smacked Thampi for a boundary to bring up his maiden IPL half century off just 25 balls before Afghan leg-spinner Rashid came back to break the partnership in a span of three balls.Rashid first saw the back of de Villiers brilliantly caught by Dhawan at deep backward square before packing Moeen one ball later, caught behind by Shreevats Goswami.With both the set batsmen back in the dug out, the visitors sniffed at a smaller total when they packed an in-form Mandeep Singh (4) cheaply.But New Zealander Colin de Grandhomme (40 from 17; 4x1, 6x4) and teenaged Sarfaraz Khan (22 not out from 8; 4x3, 6x1) lit up the stadium with some late order fireworks, to ensure the home side crossed the 200-run mark with a quick-fire 34-run stand.For the tourists, Rashid once again emerged the pick of the bowlers with figures of 3/27, while Siddharth and Sandeep chipped in with two and one wickets, respectively.